Debby: How did a black man headed towards a career as an NFL coach end up in a career focused on whiteness and racial justice? Eddie: [laughs] The story of how I went from wearing a whistle to wearing a social justice hat? The most interesting part of that story is the realization that came with it – that there’s something greater than us that drives our path in life. I am the furthest I could be from the path I thought I’d be on. As for how it happened? It started with a few really good people I met in my Master’s program, people who pushed me to think bigger. Also, as I matured, I realized a lot of what I wanted to do for young black boys – helping that population was what led me to coaching – wasn’t as satisfying as I thought it would be. There was something missing, a void. That’s why those key people telling me to think bigger were so important. They kept reminding me I’d have far more opportunities as an intellect than as a football coach. Debby: How long have you been engaged in this work? Eddie: 1992? 1993? Somewhere in there. And then I started my consulting business in 1996. Debby: As I’m listening to you, I’m realizing it’s hard to pin down a specific “when I began this work” time because it’s a process, an evolution. Eddie: That’s right. And for me, it started when I was coaching and decided to volunteer in a local preschool. That’s where I realized there was a void in my coaching career, where the light started to flicker. Debby: Over the course of those years, what progress have you noticed? Eddie: I feel like some of what I’ve noticed is a broadening of the discussion. Not that there’s anything wrong with diversity, and Kumbaya, and can’t-we-all-just-get-along, but there’s been an expansion beyond just that. One way I notice it is by the way people across the country respond to the name of the conference. People at least recognize the term ‘white privilege’ whereas back in the 1990s that wasn’t the case. Also I’ve seen a lot of growth around publishing, your book is a testament to that. In the 1990s only a few works on white privilege existed, Peggy McIntosh’s being a prime example. Since then so many significant projects have emerged in publishing and research. The business of ‘diversity’ has grown so much, both on the supply and demand side. I also feel more curiosity than skepticism when I give presentations. That’s progress. Finally, and maybe this is just a soft spot of mine, but I like to think more young people are willing to grapple with this topic. The downside of all this positive energy, or course, is increased resistance. Debby: Can you say more about what you’re noticing? Do you see setbacks or entrenchments? Eddie: Well most significant is the amount of resources attached to the pushback and entrenchment effort. 21st century resistance is increasingly organized and resourced. Debby: Can you give some specific examples? Eddie: Sure. Extreme right groups have a lot of connectivity and momentum right now and aren’t shy about leveraging it. The conference is in its fourteenth year, and we’ve always had skeptics and critics, but this was the first time we had someone write about it in a conservative paper. Once the article was published in the Weekly Standard, the rhetoric was recycled on extremist/white supremacist websites like Stormfront and other conservative sites. Social media has a lot to do with how easy it is to spread ideas, regardless of their merit. The University of Colorado Colorado Springs, who has sponsored WPC for years, has been dealing with more and more persistent resistance over the years. In fact, the WPC and UCCS have decided to dissolve our relationship, partially due to the onslaught of persistent resistance. Debby: That’s a big difference. I see what you’re saying. Eddie: It’s amazing. Another example is one of our colleagues, Dr. Marguerite Parks, do you know her? Debby: No, I don’t think so. Eddie: Well, she’s out of University of Wisconsin Oshkosh and she’s on some hate list created by the extreme right. What’s the name of that list? Hold on a minute. I’ve got Dr. Parks here to explain what happened to her. Debby: Hello Dr. Parks. I’m curious to hear what happened. Dr. Parks: [sighs] It began when I was giving a workshop with a Nigerian colleague about the differences, according to race, that teachers contend with when talking about racism in the classroom, meaning the race of the teacher. I heard someone was videotaping it, which isn’t typical and isn’t allowed, so someone stopped them. But of course, they’d already gotten footage, which they then put on the Internet with some negative editorializing. I started getting pretty hateful emails. The strangest moment was when I got a packet from Toughen Up America. They call themselves a comedy team but it didn’t feel very funny to me. In the packet was a certificate saying I was on their “Weak List” as well as a calendar from the National Rifle Association. That felt pretty threatening. Debby: How long have you been doing this work? Dr. Parks: For about twenty years. Debby: And this kind of pushback is new? Dr. Parks: Totally. This work has always elicited questions and challenges, which I’ve come to expect, and take time to address face to face with workshop participants, but this was altogether different. These are faceless people who don’t know me or, actually, much about my work other than that tiny snippet of editorialized footage. Debby: Wow, I didn’t expect that detour, but am glad for the insights. Ready to go back to the questions I’d planned? Debby: As diversity director of first The Bush School and now Brooklyn Friends School, you spend a lot of time learning about the next generation’s relationship with issues of privilege and discrimination. How are their experiences different than those of us born in the 1950s -1970s? How are they similar? Eddie: The similarity is the disparity that continues to exist. The difference is that its less hidden and that the gap – according to research — is getting wider. Another similarity is that the people who come together seem similar in terms of where they come from and the diversity they represent. There’s a similar look and feel to these groups. What’s different is that the hunger and sacrifice we saw in the 1950s, 60s, and 70s isn’t there. I like to say, “There’s less of a willingness to die.’ Back then, your life was on the line when you advocated against racism. Another difference I think is that there’s more access to the privileged class. And then again, there are a lot of similarities in terms of moving this group along, explaining that it is still a problem, that there’s still work to do. Debby: When you founded the White Privilege Conference (WPC) 15 years ago, how did you come up with the name? How does the name work for the mission? How does it work against it? Eddie: The name came from the work – from Peggy McIntosh, Joe Feagan, Paul Kivel – from the work and the research. It works against the mission of the conference when people mistakenly think we’re beating up on white people. It can create a defensive reaction. On the other hand it makes it clear right away that this isn’t the Can-We-All-Just-Get-Along conference. I think the name has helped to establish the reputation of the conference as the NFL of social justice conferences. I mean this is where you go when you’re ready for the big league. We’re able to say, “If you’re serious about the work, we’re the place to come.” That’s the way we roll. Debby: I find that sometimes there’s a power and poignancy in this work that moves me to tears. Can you describe a moment that’s moved you in a profound way? Eddie: Well just last year at the conference, when the elder from the Japanese internment camp spoke, I had one of those moments. Or when the indigenous people of a given conference location come up on stage to perform or speak, share stories that only a few thousand people are still around to tell. Seeing the conference create space for moments like those, where those people and that history get aired in ways they might not be able to anywhere else – that moves me. Also, seeing young people – high school and college aged kids starting so young to grapple with these issues moves me. To think that WPC is setting a standard for them that’s so far beyond Diversity 101 hits me. Seeing them challenged and influenced in positive ways at such a young age moves me. Debby: What gives you the greatest hope for the future of racial justice? Eddie: Well the passing of Mandela, wow. There’s an example of someone who got results, someone who took on that kind of oppressive system and brought it to its knees makes me realize that it is possible for one person to get mad enough to take on oppression and get things done. My greatest hope is that the space that WPC creates – its content, its programs, its structure – is a space that could inspire a Mandela. For me personally, this is a conference that was started by something far greater than me and all I did was listen to that inner voice. Knowing that when someone listens to their inner voice great things can happen. That gives me hope. Debby: What are the biggest challenges you foresee in the next ten years? Eddie: I think we’ll see increasing disparites. Plus, we have a new problem emerging as a result of technology. The very people we’ll need to work on these issues in the future – organizers, communicators, critical relationship builders – aren’t developing those skills because they’re so hooked into their technology. There are also consequences we’ve never seen before. When someone can get sued or get a poor evaluation for the content they’re teaching (referring to Shannon Gibney case) that’s a 21st century challenge. When you can’t even teach this stuff without fear of serious, serious consequences? Wow. Debby: I have hundreds of white family and friends who want so much to do the right thing when it comes to racism. Many of them are in positions of considerable power to create change – through policy, donations, and simply modeling behavior. Anything in particular you’d like to ask of to this group? One: Be courageous, this is what we need most from white people. I think the spirit of courage has been lost. Two: Give strategically. Look for organizations that do more than diversity work and then hold your charities accountable. Are they really doing what they say they do? Three: Start earlier. I think there’s a critical need to demonstrate to kids something more than we-can-all-get-along. Your kids are the inheritors of wealth and resources, so spend time helping them understand the difference between charity and change. Debby: So, back to football – favorite team or teams? Eddie: Oh I’m a die-hard, all-my-life Dallas Cowboys fan. Unfortunately the last eight years haven’t been so good. But I’m still a Cowboy through and through. That’s who I am. 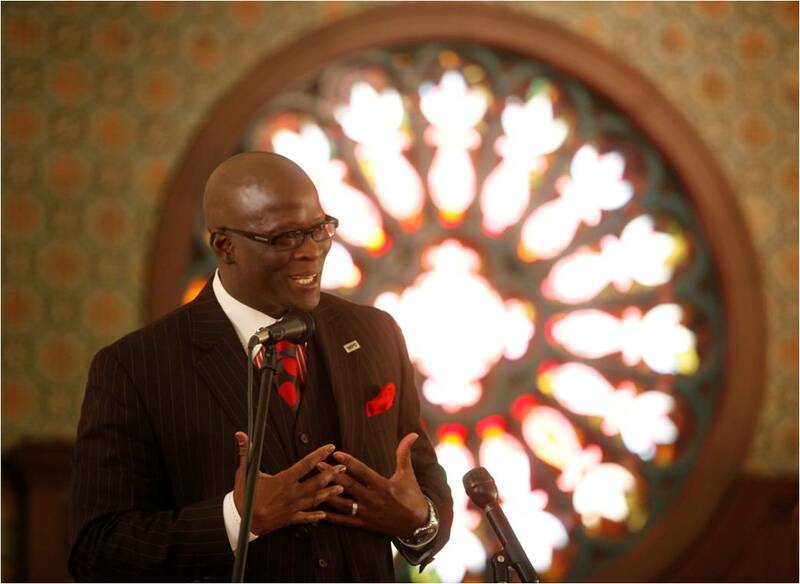 Dr. Eddie Moore, Jr., founder and director of the White Privilege Conference, currently serves as Director of Diversity at Brooklyn Friends School in Brooklyn, NY. He also travels worldwide as a consultant and speaker on topics such as stereotypes, youth and self-esteem, cultural diversity, and the global workplace. Dr. Moore holds a Ph.D. in Educational Policy and Leadership Studies from the University of Iowa. Debby/ great Interview with Dr. Moore! In 2013, I have also seen more mainstream articles and references to “white privilege” like never before. This is also testament to the last 14 years. On flipside, the resistance Dr. Moore cited is very serious and, and it is also accompanied by a campaign of misinformation that distorts everything white privilege and WPC is about. Thanks again for article and helping to frame the issues correctly. wonderful interview! I loved learning about Dr. Moore and his work. Great talk. Eddie’s work is fantastic and deserve such attention. He’s inspiring us to engage in similar work in Europe. Keep up doing this great work.